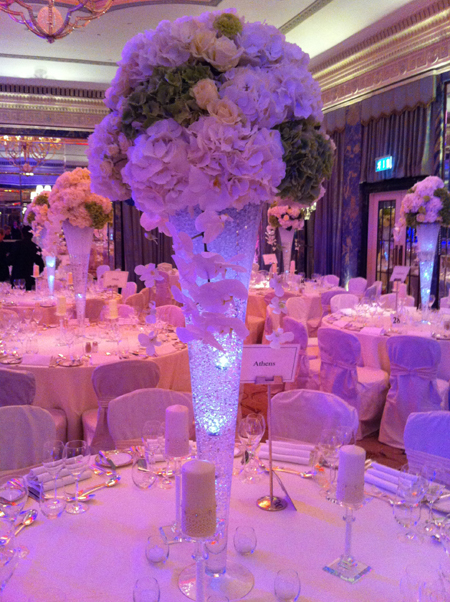 A conference on the theme Going Global@London, was held on Sunday 30th June 2013 at the Dorchester Hotel London. The conference was organized by Global Citizen Forum (GCF) and prominent speakers at the event included global citizens like Gopichand Hinduja, Chairman, Hinduja Automobiles, Lord Raj Loomba, Prof. Olinga Ta’eed, Director CCEG, Tommy Hutchinson, Founder i-genius and Steve Moore, CEO, Britain’s personal best. The conference was well attended by leaders from all walks of life including academicians, youth leaders, social thinkers and artists. Another highlight of the conference was the felicitation of GCF Founder, Dr BK Modi by the United Peace Federation (UPF) with an ‘Ambassador for Peace award’ for his international contribution to society. 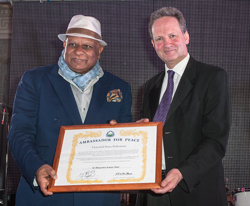 The award was presented by Robin Marsh, Secretary General of the Universal Peace Federation (UPF). Dr BK Modi has been actively involved in society through various leadership roles and instrumental in advancing the social and cultural interests of society across the World. Dr B K Modi is an individual who is braving the odds and making a real difference to the lives of so many different people in society. He strives to ensure that people from all of the global society, in particular the elderly, women; young people, the disadvantaged and vulnerable are given the opportunity to gain confidence, training, empowerment skills and self-awareness skills. Dr B K Modi has made it possible for communities to be sufficiently empowered, informed and supported in order to make a strong impact on ethics, equality, fairness, values and governance. He is a tireless advocate for both the community’s interests as well as global interests. He continues to fight social ills plaguing society and encourages people with a vision for the future which they might not have otherwise seen. 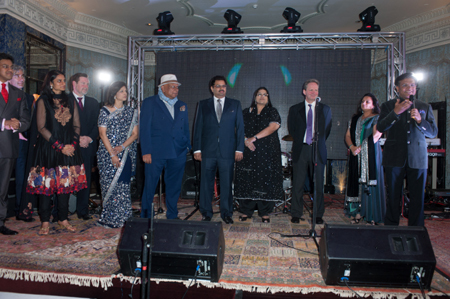 The event was supported by the Centre of Citizenship, Enterprise and Governance. Speakers at the conference discussed the ways and means for uniting like-minded citizens across the globe to promote tolerance and understanding. They opined that technology can be effectively used as a binding factor in uniting global citizens and should be now considered as basic human right and advocated free movement among countries to encourage sustainable development. The conference attempted defining a road map for British youth, on how best to use the advantages they have as native speakers of the most widely accepted language of the world to grow as professionals of the global workforce. 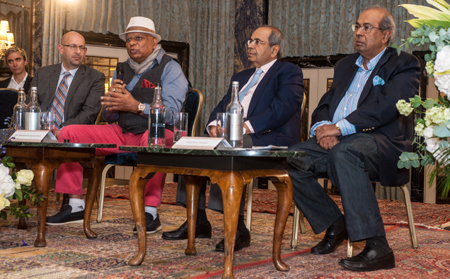 The conference was followed by a cultural evening and pledging of support by the distinguished guests including Charlie Webster, GP Hinduja, Lakshmi Mittal and to the Global Citizen Forum movement for creating a world interconnected through technology. Global Citizen Forum (GCF) is registered in Singapore as a not for profit organisation and will be opening a global office in London. The prime objective of GCF is to facilitate creation of a global society without boundaries of religion, ideology or geography. Global Society and the role of a Global Citizen is a pressing need in today’s day and age the world has become a global village, and technology has facilitated meaningful dialogue on political, economic and social issues concerning the planet at large. Dr. Bhupendra Kumar Modi has always shunned conformity in order to embrace the future. As a "Futurepreneur", he has always lived and worked on the principal philosophy of challenging conventional wisdom. With nearly 4 decades of business leadership behind him, Dr. Modi has consistently spearheaded the conglomerate’s successful alliances with multinational corporations and category leaders like Xerox, Alcatel, Telstra, Olivetti, Lithographic Systems and International Paper, Telekom Malaysia and Mediatek. He is the key technology and business architect in conceptualizing, creating, developing and globalizing the Spice brand. He pre-empted recent revolutions in office automation, internet infrastructure, wireless telephony and specialty retailing. With strategic investments and smart acquisitions in mobility, finance, entertainment and healthcare spaces, the future-preneur has been redefining the art of investment sense. He has always handpicked investments and created value for all stakeholders. "I am driven by the motivation of creating value for all stakeholders through innovation and smart investments.” he says. Under his leadership, Spice Global has expanded its presence in New York, London, ASEAN region, parts of Africa and China apart from India. Its i2i strategy is aimed at establishing presence in over 20 countries -- from the Ivory Coast to Indonesia – with headquarters in Singapore. Dr Modi is a chemical engineer and holds a master’s degree in business administration from the University of South California. He has also been conferred doctorates in financial management and industrial management. As a global citizen with 14 residences around the world, Dr Modi ranks 23rd in the Forbes list of Singapore’s richest. Dr Modi is a founder member of Asia Business Council and chairman of Asia Crime Prevention Foundation’s India chapter. He was given a commendation by the US Congress for his outstanding contribution to humanistic causes. Apart from creating excellence in business, he has made commendable efforts to promote Global Citizenship. He has held wide ranging talks with leaders of all sections of society across the world. He has authored many books that portray his deep understanding of the world and humanity. They include One God, Hinduism – The Universal Truth, Performance – A Manager’s Challenge and Whispers of Peace. Dr Bhupendra K Modi has been actively involved in society through various leadership roles and instrumental in advancing the social, cultural and religious interests of society across the World. He works tirelessly in promoting inter-faith dialogue and inter-ethnic understanding on a Local, National and International level. Dr B K Modi is an individual who is braving the odds and making a real difference to the lives of so many different people in society. He strives to ensure that people from all of the global society, in particular the elderly, women; young people, the disadvantaged and vulnerable are given the opportunity to gain confidence, training, empowerment skills and self awareness skills. Dr B K Modi has made it possible for communities to be sufficiently empowered, informed and supported in order to make a strong impact on ethics, equality, fairness, values and governance. He is a tireless advocate for both the community’s interests as well as global interests. He continues to fight social ills plaguing society and encourages people with a vision for the future which they might not have otherwise seen. Dr Modi’s steadfast approach, influence and participation has been key to promoting and contributing to good race relations, social inclusion, community regeneration and interfaith dialogue within various different groups and networks. His organisation the Global Citizen Forum aims to achieve a harmonious society in which different faiths continue to honour the religious and other differences between them without compromising their respective integrities through mutual understanding, bi-lateral dialogue, trust and friendship and celebrating and building on the contribution which individuals make to their neighbourhoods and to wider society. In everything that Dr B K Modi does throughout the World he always passionately says that it is an individual’s duty and privilege as a human being to serve our society. Dr Modi possesses a sense of humour, patience, empathy and the ability to meet the challenges everyday life throws at him. He is an individual who is braving the odds and making a real difference to the lives of so many different people in society. He has made it possible for communities to be sufficiently empowered, informed and supported in order to make a strong impact on ethics, values and governance. Within every individual lies the desire and capacity to create positive change. Dr B K Modi is one such individual who has made this happen. The work that he has done with great selflessness and dedication to society’s development is commendable and his efforts are deserving of recognition.